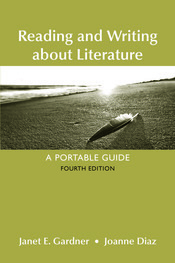 Far less expensive than comparable guides, Reading and Writing about Literature: A Portable Guide is an ideal supplement for writing courses where literature anthologies and individual literary works that lack writing instruction are assigned. This brief guide introduces strategies for reading literature, explains the writing process and common writing assignments for literature courses, provides instruction in writing about fiction, poetry, and drama, and includes coverage of writing a research paper as well as sections on literary criticism and theory. This volume in the popular Bedford/St. Martin's series of Portable Anthologies and Guides offers a trademark combination of high quality and great value.